Entity that came to talk: Johnakan Ur-El. Johnakan Ur-El: Organ donation is a beautiful act of love, just like it was the first heart transplant made by the doctor Barnard . Interlocutor: According to my understanding, the first person who received his heart transplant suffered very much after the surgery because of transplant rejection. Johnakan Ur-El: Keep in mind that from the first transplant, more than a quarter of a century has passed and Medicine has advanced very much ever since. 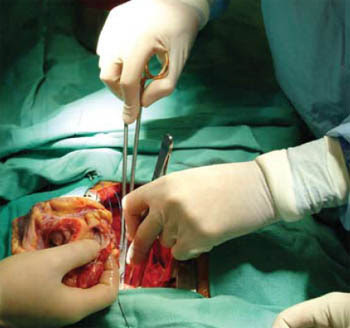 Nowadays, before the surgery, rejection tests for heart transplants are made... And, not always there are problems in the postoperative course. In many cases people who received an organ, live many years of normal life after the surgery. Interlocutor: And doesn't it go against any karma? Johnakan Ur-El: No, because in those latter years to the transplant, the person has the possibility to be useful and revert some karma. Even being a negative person can constitute indirectly a learning element of tolerance and patience to the other beings arround him. In the issue of organ donation, let’s look at the positive things, which are more than the negative things. Interlocutor: Concretely, and only taking about the postoperative course, Can’t we say that the remedy is worse than the disease? Johnakan Ur-El: No, because as long as the person can live and do things in the physical plane, it’s fine. Anyway, the organ donation is always an act of love. Interlocutor: Then, we should be totally in favor of organ donation, without keeping in mind the postperative course? Johnakan Ur-El: Yes, of course. Besides, we are only speaking of heart transplants, but not only is transplanted this organ, but also there are pancreas transplants that solve problems of people with diabetes. There are diabetic patients who are unable to get out of their homes because the inherent hypoglycemia to their disease provokes sudden faintings and through a transplant they can make a normal life. Johnakan Ur-El: And I will give you a piece of information that most of the people don't know. I’m receiving this information from a very famous doctor of the south who recently disincarnated, so you can be sure of it. When one speaks about physical convulsions, the reference is made to the epileptic convulsions, to convulsions related to brain disfunctions, or to convulsions with feverish peaks. Well, there is another type of convulsions and they occur in people with hypoglycemia. Interlocutor: Are you telling me that hypoglycemia also causes convulsions? Johnakan Ur-El: Correct... My vessel is very tired and his decoder doesn't decode well, for that reason it’s not convenient to continue. When this kind of sessions are held, where many truths are given in little time, the entities of the error reinforce their darts to hinder the communication. Interlocutor: We can suspend without problems the session because the topic was properly clarified. Entity that came to talk: Master Ruanel. Interlocutor: Well, listen to me Master. With regard to organ donation, I read what I have for the record: It is a very important topic. Why is the 10% trapped even though there is brain death if his organs keep working with some devices? In this case, Is there some chance that the extraction of organs be made being the 10% embodied, even with brain death? What does the 10% feel in that inprisonment in a corpse with brain death, aside from the organ donation and being somebody kept alive with the organs working? Are there cases in which the person’s corpse and his organs continue working by some reason? Let’s suppose that somebody had his head severed. Is it instantaneous the separation of the 10%, or there are seconds or minutes where the 10% is still trapped? I do not know how to explain it better Master. Ruanel: Seconds, tenths of second, no more than that. If the person is beheaded, automatically he/she does not have mental decoder and his/her heart stops instantly. Interlocutor: Perfect. But we are speaking that the heart is a main organ? If it continued working would the 10% be trapped? Ruanel: Yes, but obviously that doesn’t work when the person is beheaded. As to the first question, the heart doesn’t work unless artificial mechanical methods make it work. Interlocutor: Perfect, but is the 10% trapped? Ruanel: Due to an issue called principle, it is an esoteric principle so-to-speak. But I do not like to say it because you are enslaved by words, you express yourselves by mean of words and not by mean of concepts. Then, I don’t like the word law, I’d rather use the word principle. It is a principle, a divine ethical principle and the thetan luckily or unfortunately is connected to the physical body. Ruanel: I have already said in some opportunity, a long time ago that if scientists were able to deepen the subject of cryonics, the thetan has the freedom to exert its free will and go in mission, but it always be connected to that body. Not right there, but it will be always connected. If within 400 years hypothetically, they bring that body back to life, it would be the same thetan and not another. Is that clear? Interlocutor: Yes Master, Has it happened that they extracted organs being the 10% still incarnated? Ruanel: Yes, in most of the cases the 10% is still there. Ruanel: In brain death, the 10% automatically disembodies. Ruanel: Unless they keep the heart and the other organs working by means of mechanic artifacts. In that case the 10% does not disembody. Ruanel: The body is not alive according to the concept you have, but because of a principle of ethics the 10% doesn’t disembody. Ruanel: And automatically if they extract all the organs being the 10% there, the body does not suffer because when there is brain death there is no suffering. Interlocutor: So the 10% doesn’t suffer? Interlocutor: But Is there some feeling of breathlessness Isn’t there? Interlocutor:Let’s see if I understand. Is the 10% connected inside or outside? I do not know if you understand me. Ruanel: The 10% is connected inside and also can be connected outside, just like when you make astral trips. Interlocutor: Okay. So There is no problem for the 10% if they extract the organs. Ruanel: First, I am going to clarify one thing. All the incarnated beings are animated by a 10% of spirit. That 10% doesn’t suffer any of the ailments of the physical plane because it doesn’t have senses. The body, which is animated by that 10%, is the one that has senses. Ruanel: if you, as incarnated beings, are animated by 10% of spirit and they pinch you, it is going to hurt the 10% because the body will transmit it to the 10% that animates that body, but in fact the body is the one that is hurt since the 10% continues being a spirit. Then, if that being has brain death, the 10% won’t feel any pain because no nerve wil transmit the pain to the brain. Ruanel: Don’t confuse it with coma like other people do, because from coma the person can be brought back to life, on the other hand, from brain death it’s impossible. Interlocutor: I want to clarify one thing. Isn’t there any kind of problem in the extraction of organs, even though the 10% is inside, the body? Ruanel: if organ donation saves other lives, it is welcome. But I clarify that the thetan continues being there. Interlocutor: but Isn’t there any problem? Ruanel: No, absolutely not, it doesn’t have any problem. Interlocutor: So the thethan only waits for the extraction of organs to be concluded, nothing else? Eugenio: Master Ruanel, I’d like to ask an specific question: Is the donor who had brain death connected spiritually somehow with the receiver of the organ? Ruanel: No, no. Absolutely not. Because the thetan who dwelled in that body, has no more commitment once its body is dead, although the organs have been extracted and transplanted to other bodies, -I mean the case when more than one organ has been transplanted-, heart, kidneys etc. It is another mental decoder, another spirit that animates the other body/bodies, and then the thetan does not have anything to do there. ¿Is that clear? Eugenio: Yes Master, It’s clear. The Doctor Christiaan Barnard performed the world's first successful human-to-human heart transplant. This entry was posted at Sunday, October 25, 2009 and is filed under Medical Science . You can follow any responses to this entry through the .